Bound Volumes are digitised by using specialist advanced equipment to capture extremely high resolution images of their pages, either as single pages or double page spreads. Digitisation takes place in a humidity and temperature controlled environment, all the correct procedures are followed to ensure the best possible handling of the original material. Our advanced digital capture equipment and techniques guarantee the optimal digital output across a wide range of varied material. 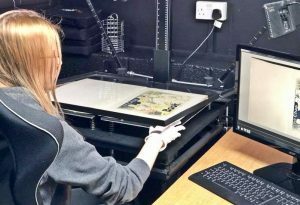 As specialists in digitising fragile archive collections, our scanning technicians are fully trained in professional handling procedures for working with delicate books and employ a gentle, “white gloves” approach at all times. This ensure that no harm or damage occurs to the materials. Our unique planetary overhead one-shot book digitising equipment is designed to apply the absolute minimum of pressure to the volumes during the digitisation process. As part of this, our book scanners feature state-of-the-art auto-adjusting book cradles, this effectively eliminate any unnecessary trauma on the books being digitised and ensures that books are totally supported at all times. We utilise a diffused, non-heat producing LED lighting system that diminish any risk of heat damage. As an optional service we can fully OCR the contents and convert the images into a searchable medium like PDF or ebook.